I’ve got another full week of living a single life. Sadly, right now, the single life means that I have to deal with bugs on my own, cook something besides carbs, and remember to move the car for street sweeping. Of course, it also means that I can be as loud as I want (within reason) all night long with all the lights on, if I so desire. No one will eat the last bread product and not leave me anything to toast for breakfast. And I will not have to watch that Nathan Fillion cop show and instead can binge on Acorn tv shows that Rudi has not yet laid claim to being interested in (although probably only because I didn’t ask him). This week, I’m going to send out some resumes, take a first pass at the taxes, and do some spring cleaning. 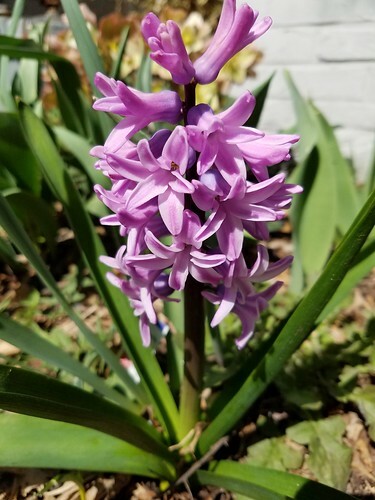 I’m also going to play volleyball, look for spring flowers (I spotted my first hyacinths this weekend), and spend as much time outside as I can. I may to the movies, catch a concert, or see a friend, but none of those are carved in stone. I hope you have a great week, too! This sounds like an awesome week! (Sans the bug thing that is…) Good luck in the sending out of your resume and in taxes! It’s our March Break this week. I’ve had a very productive day (for me) as I’ve been for a walk at the local gym, made white ch chip macadamia cookies, and cleaned out the garbage from the car after two weekend trips with teenagers. I’ve also listened to a good chunk of Flavia’s latest. I expect it will be all downhill the rest of the week, lol. Oh How fun! I hope you have a really relaxing time. Taxes are done here. Bugs never end. I can do bugs, but no mice!